A variety of textures and light sources combine to create a beautiful finished kitchen. The panels were easy to cut... it was a snap to cut the round holes in order to install the lights. I also painted the support rails to match and blend in (I did this before installing them). I have just raved to everyone about these fantastic tiles and the cost was the same price as using the boring mineral fiber tiles they sell at Home Depot or Lowes. 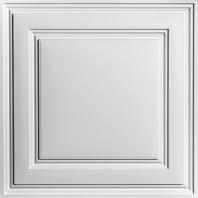 I wish our ceiling had more clearance, I would have loved to try some of the deeper inset styles.